Ibn Umar (r.a) said : I heard rasool allah (s.a.w) saying: whoever dies without an imam he dies a death of jahilyyah and whoever breaks disobedience he comes in the day of judgement without a hujja. 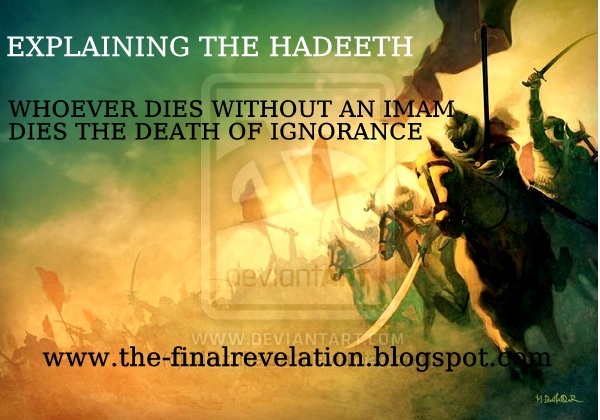 "Whoever dies without an Imam dies death of Jahiliyyah"
Explanation: The injustice done with this narration is that people (especially Shia'as) try to give this narration their own interpretations, and different people give different interpretations to it, to achieve their evil desires. Some ignorants who lack common sense argue that this narration proves that every human being SHOULD die with an Imam, otherwise his/her death is death of Jahilliayh(ignorance). But here we will explain this narration with the help of another authentic narration, because the best explanation could only be given by Prophet (S.a.w) and manier times we find that one narration explain the other just like how one verse of the Quran explains the other. First of All, one opinion is what al Shaykh Abu Hatim (rahimuhullah) explained this as prophet (sallalahu alaihi wa ala alihi wa sallam). Meaning that he was Imam of all world, and whoever died without believing in him, or accepting him, died as a person in period of jahiliyah. So the above authentic narration explains that this narration which the Shia'as quote against us in favor of their 12th Imam who is supposedly hiding in a cave since decades, actually means that one who has an Ameer and defies him and doesn't recognize his Ameeri, then he dies the death of Jahilliyah. So If someone from the shias would argue with you regarding their so called 12-th Imam, then we reply back in many ways, one of which is by saying that the Imam should be present, so people could follow him, and obey him. but in their case, their 12-th imam is absent (hidden in a cave), so how on earth they could follow him? "Whoever dies without treating his wife in a good manner dies the death of jahiliyya." Now only a fool could argue that this narration proves that every man should be married. Where as infact this narration is only directed towards married people, it doesn’t include bachelors in it. Similarly, the narration in question explains us that, when there is a legitimate Ameer/caliph then disassociating from his obedience and dying in that manner will mean that the person died without an Imam which is like the death of Jahiliyah. But this condition is not applicable to those people among whom there is no Caliph or Ameer, like we explained in our example that the condition was not applicable to people who were bachelors. More Importantly, the prophet (s.a.w) even prophesized that there will be a time when there be no community and no Ameer/caliph, which even strengthens our explanation. It has been narrated on the authority of Hudhaifa b. al−Yaman who said: People used to ask the Messenger of Allah (may peace be upon him) about the good times, but I used to ask him about bad times fearing lest they overtake me. I said: Messenger of Allah, we were in the midst of ignorance and evil, and then God brought us this good (time through Islam). Is there any bad time after this good one? He said: Yes. I asked: Will there be a good time again after that bad time? He said: Yes, but therein will be a hidden evil. I asked: What will be the evil hidden therein? He said: (That time will witness the rise of) the people who will adopt ways other than mine and seek guidance other than mine. You will know good points as well as bad points. I asked: Will there be a bad time after this good one? He said: Yes. (A time will come) when there will be people standing and inviting at the gates of Hell. Whoso responds to their call they will throw them into the fire. I said: Messenger of Allah, describe them for us. He said: All right. They will be a people having the same complexion as ours and speaking our language. I said: Messenger of Allah, what do you suggest if I happen to live in that time? He said: You should stick to the main body of the Muslims and their leader. I said: If they have no (such thing as the) main body and have no leader? He said: Separate yourself from all these factions, though you may have to eat the roots of trees (in a jungle) until death comes to you and you are in this state. Comment: So this narration shows us that there would be a time when there will be no leader(Ameer)(as it is evident from the current era). Also the prophet (S.a.w) didn’t share the mind-set/belief like the shias who claim "The earth can’t survive without a leader" . He(saw) wasn’t surprised when such a question mentioning the absentee of an Ameer was asked. He (s.a.w) didn’t refute the question saying " how could the earth survive without a leader?" rather he answered or gave a solution for such a situation. This itself is sufficient to understand how incorrect the home-made beliefs of shias are. 2. It has been narrated on the authority of Ibn ‘Abbas that the messenger of Allah (may peace be upon him) said: One who found in his Amir something which he disliked should hold his patience, for one who separated from the main body of the Muslims even to the extent of a handspan and then he died would die the death of one belonging to the days of Jahiliyya. His saying, "...left obedience...", meaning obedience to the Khalifah concerning whom there is agreeement. And it is as if the intent here is the Khalifah of a particular region because the people have never gathered together behind a single Khalifah in all the lands of Islaam since the time of the Abbasi State. Rather, the people of every region were independent with someone presiding over their affairs. If the hadeeth was taken to mean the overall Khalifah which the people of Islam had united behind, there would have been no benefit in it. Hashim ibne al-Barld (Sahib al-Barid) said: "Muhammad ibne Muslim, Abul Khattab, and I were together in one place. Abul Khattab asked, "What is your belief regarding one who doesn't know the affair of Imamate?" I said, "In my view he or she is a unbeliever. "Abul Khattab said, "As long as the evidence is not complete for him or her, he or she is not a unbeliever; if the evidence is complete and still he or she doesn't recognize it, then he or she is an unbeliever. " Muhammad ibne Muslim said, "Glory be to God! If he or she doesn't recognize the Imam and doesn't show obstinacy or denial, how can he or she be considered an unbeliever? No, one who doesn't know, if he doesn't show denial, is not an unbeliever. " Thus, the three of us had three opposing beliefs. "When the Hajj season came, I went for Hajj and went to Imam as-Sadiq . I told him of the discussion between the three of us and asked the Imam his view. The Imam replied, "I will reply to this question when the other two are also present. I and the three of you shall meet tonight in Mina near the middle jamarah."" That night, the three of us went there. The Imam, leaning on a cushion, began questioning us." "What do you say about the servants, womenfolk, and members of your own families? Do they not bear witness to the unity of God?" "Do they not bear witness to the prophecy of the Messenger?" "Do they recognize the Imamate and wilayah (Divinely-appointed authority) like yourselves?" "So what is their position in your view?" "My view is that whoever does not recognize the Imam is an unbeliever." "Glory be to God! Haven't you seen the people of the streets and markets? Haven't you seen the water-bearers?" "Yes, I have seen and I see them." "Do they not pray? Do they not fast? Do they not perform Hajj? Do they not bear witness to the unity of God and the prophethood of the Messenger?" "Well, do they recognize the Imam as you do?" "So what is their condition?" "My view is that whoever doesn't recognize the Imam is a unbeliever." "Glory be to God! Do you not see the state of the Ka'bah and the circumambulation of these people? Don't you see how the people of Yemen cling to the curtains of the Ka'bah?" "Don't they profess monotheism and believe in the Messenger? Don't they pray, fast, and perform Hajj?" "What is your belief about them?" "In my view, whoever doesn't recognize the Imam is an unbeliever." The Imam said : "Glory be to God! This belief is the belief of the Kharijites." At that point the Imam said, "Now, do you wish me to inform you of the truth?" Hashim, who in the words of the late Faydh al-Kashani, knew that the Imam's view was in opposition to his own belief, said, "No." The Imam said, "It is very bad for you to say something of your own accord that you have not heard from us. " Hashim later said to the others: "I presumed that the Imam affirmed the view of Muhammad ibne Muslim and wished to bring us to his view.